Canine parvovirus poses some interesting challenges that will affect how we communicate to our clients regarding the care of their pets. Canine parvovirus is genetically similar to feline panleukopenia virus. They are both in the “parvovirus” family. They cause similar symptoms and have similar physical characteristics. The dog parvovirus did not exist on Earth before 1978. A mutation of the feline strain created the disease in dogs. Parvo affected dogs of all ages causing severe bloody diarrhea and rapid fulminating sepsis and death. The feline parvovirus vaccine was used to forestall the disease because there was no vaccine available at that time. Many veterinary facilities reported the loss of entire kennels of dogs. This infection made the national news and was rampant for nearly 3 years. Immune dogs survived and non-immune dogs died. These immune pets passed along immunity to their offspring, which slowed the progression of the infection. New puppies, which replaced the dead from Parvo soon, contracted the disease from the environment and died as well. Parvovirus lives in the soil for over a year and it is spread by feces, urine, and vomit from the infected dogs. Today, parvovirus affects only those pets, which have poor immunity to parvovirus. Four months to six-month-old puppies are the most affected, whereas older pets are usually immune. Immunizing puppies against Parvo is more difficult than most other viral diseases. This is because of the strong immunity that is passed from the mother dog to the pups. It would seem that if the mother passes strong immunity to the pups that they would be better protected than if the maternal immunity were weak. However, this strong maternal immunity to parvovirus infection also attacks the vaccine when it is given preventing immunization from occurring. Most puppies that are vaccinated before 14 weeks of age develop little or no immunity to parvo. Vaccination between 16 and 18 weeks and even as late as 22 weeks of age has been necessary to protect puppies against parvo. The maternal immunity has the benefit of protecting the very young puppy against this terrible disease. Yet this maternal immunity will eventually run out leaving the puppy open for infection. The problem arises when the maternal immunity is powerful enough to block the parvo vaccine but not powerful enough to block infection with the wild or “street” parvo. There seems to be a 2 to 4 week window of danger for parvovirus infection between the time when the maternal immunity wanes and the vaccine immunity can develop. This problem is being addressed by the companies that produce the vaccines yet there is still controversy as to the best vaccine for the prevention of parvo. We recommend vaccination starting at 8 weeks of age, progressing ever three weeks until the last vaccine is given at 20 weeks of age. “Mrs. Jones, “I see that you are concerned about the possibility of your puppy having a serious disease like parvo.” “You have followed our vaccination instructions and yet your puppy may have contracted this very serious disease. Your are questioning how this might happen.” “First I want you to know that it can happen despite all the precautions”. Four major factors to consider with parvovirus infection that can undermine any vaccination protocol. First, enough viruses can overcome almost any level of immunity – think of immunity as “magic bullets”, each bullet will kill one virus. If the pet has enough “bullets”, he will win and infection will not occur. If there are not enough “bullets” the virus will win and infection will occur. Puppies are born with borrowed “bullets” from their mother. These “bullets” prevent infection at a very young age. Unfortunately these “bullets” can “shoot” the vaccine and prevent it from working. Parvovirus immunity depends on the ability of the vaccine to bypass the mother”s immunity. Unfortunately, this immunity may prevent a vaccine from working for as long as 20 weeks. Some dog breeds seem to be very susceptible to parvovirus infection. This susceptibility may be due to a genetic flaw in the production of intestinal antibodies. These breeds include Rottweilers, Dobermans and Pit Bull dogs. Sometimes debilitation, poor nutrition, and parasites can render a vaccinated dog susceptible to parvovirus infection. This may occur because of limited ability to form immunity or because the condition actually helps the virus infect the body. The latter occurs with parasite infections. Q If Parvovirus is in my back yard and kennel, what can I do to kill it and prevent my other new puppies from getting it? I understand your concern about wanting to prevent this from happening to any other dog. We want the same thing. Parvovirus is very difficult to kill and will live in your environment for over a year. When making recommendations to dog breeders or kennels with large numbers of pets with this potential the following recommendations are made. Remove all animals from kennels. Clean the kennels with bleach solution (1:32 dilution) each day as if there were dogs present. Continue this cleaning for two weeks. Remove all bedding and blankets and either burn these or soak and wash these in bleach. Make sure there are no internal parasites and the puppy is on the best nutrition as possible. Please keep your pet vaccinates but do not over vaccinate your pet – this has been associated with severe reactions that can actually cause more problems than parvo. Despite the precautions parvovirus may infect pets kept in a contaminated environment because the virus number exceed the number of “bullets”. This can only be remedied by raising your puppy in another environment until he is 6 months old. Q Why is parvovirus infection so serious? How can it kill my puppy? Parvovirus opens a doorway for infection between the intestinal tract and the blood stream. The intestine is infected to the point of bleeding. Large numbers of blood vessels feed the intestine and are opened during the infection. Bacteria reside in the intestine and normally aide in the digestive process. These bacteria are allowed access to the blood stream through the open blood vessels. This causes bacteremia or sepsis which is very serious. Parvovirus also kills white blood cells. Your puppy should have a normal white blood cell count that would help protect the body against infection from the bacteria in the intestine. These white blood cells engulf bacteria and help prevent severe infection. The normal white blood cell count in a sick puppy should be slightly higher than a normal puppy. This count should be about 15,000. Unfortunately, parvovirus infects and kills white blood cells as well causing a very low count like 1,500. This is not enough white blood cells to prevent the gut bacteria from causing death. Parvovirus infection causes blood diarrhea and vomiting resulting in significant fluid loss from the puppy’s body. This dehydration alone can lead to death if not treated aggressively. Q If parvovirus infection is so bad, how can we possibly treat it? Parvovirus can be treated successfully if aggressive therapy is started early in the course of the disease. The most common problems are identified and treated. Nutrition – unless the puppy has the energy to fight the disease, he will loose. Great nursing and love can make all the difference – using disposable diapers allows easier cleanup and disposal of infected materials which makes it easier to care for such a sick puppy. Some puppies may have a mild case of parvo. These animals may not need the aggressive care outlined above. Home care is a possibility but is ill advised. Humane euthanasia is a better alternative for the severely affected puppy where financial concerns prevent aggressive therapy. In mils cases when cost is a concern; we will send fluids and antibiotics home for the owner to administer subcutaneously. Q How do you tell parvovirus infection from coronavirus infection? Parvovirus infection will usually be painful in the early stages. Palpation of the puppy will elicit a painful “grunt” when palpating the left cranial abdomen. Coronavirus infection will not be painful. The abdomen will have gas and fluid present. Parvovirus usually affects 4 to 6 month old dogs and coronavirus will affect adult dogs as well as puppies. Parvovirus causes bloody diarrhea and coronavirus cause yellow foamy diarrhea. 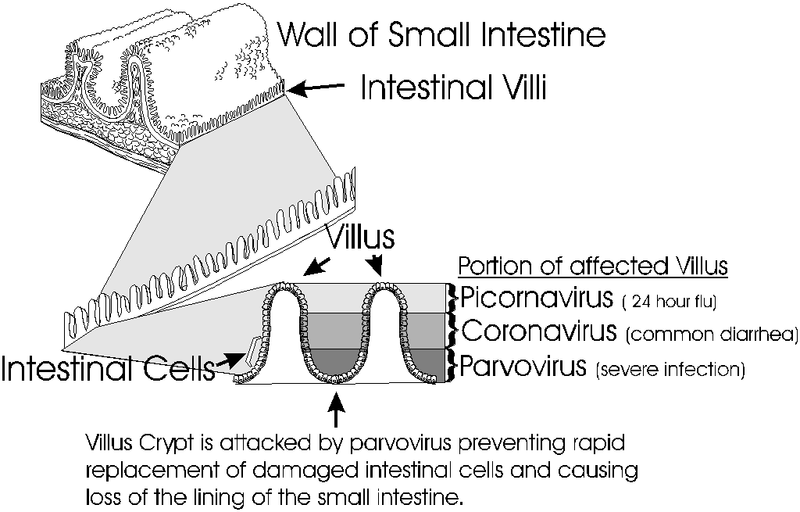 Parvovirus affects the crypt cells in the intestinal villus and coronavirus affect the tip cells of the intestinal villus. Parvovirus causes a low white blood cell count and coronavirus causes a normal to high white blood cell count. How Vaccines Work – What is DNA?